Happy new year, readers, and here’s to a productive and inclusive 2017! We talk a lot about the importance of social-emotional development here at the Brookes Inclusion Lab–in 2016, we did a blog series on this vital topic, and we’re planning even more posts for this new year. Our posts focus on a wide range of ages and grade levels, but one of the most critical time periods to focus on is early childhood, when young learners’ attitudes and perceptions are just starting to form. Get students ready for school. Promoting early social and emotional skills is a crucial part of getting kids ready for school; Head Start, for example, lists social-emotional development as one of the pillars of school readiness. Stop the bullying epidemic. Studies show that the roots of bullying take hold in early childhood. To reduce the high incidence of bullying in schools, educators and parents should focus on promoting social-emotional health and positive, prosocial behaviors when children are very young. Set every child up for future success in life. Social-emotional skills are a predictor of future success and achievement–a recent study found significant associations between stronger social-emotional skills in kindergarten and better life outcomes in the areas of education, employment, criminal activity, substance use, and mental health. ASQ:SE-2 Parent Activities. Share these fun and effective activities with parents to help them promote their child’s social-emotional skills. Sample lesson for preschoolers. Help kids use “happy talk” with this free lesson from the Strong Start Pre-K social-emotional learning curriculum. Parent tip sheet. 17 practical ways parents can support the social-emotional development of their young children. Blog post on stress in young learners. Discover 9 stress-reducing strategies for young learners, from Brookes author Alice Sterling Honig. Newsletter article on positive interactions. See how to improve behavior in early childhood classrooms by fostering three types of positive interactions: between teachers and children, teachers and parents, and children and parents. Introduction to effective tools. Get a clear and concise introduction to four resources that can help you track the success of your positive behavioral interventions and supports (PBIS) and ensure that your interventions are helping your young learners. You’ll find a wealth of information on social and emotional skills at the NAEYC site. Check out “Making Peace in Kindergarten,” an article from NAEYC’s journal Voices of Practitioners, filled with real-world tips on how teachers can support children’s social and emotional learning. Head Start’s dedicated page on Social & Emotional Development gives you practical tips, articles, webcasts, and more. A treasure trove of resources awaits you at the ZERO TO THREE site. Get podcasts, videos, and parenting resources on social-emotional topics like empathy, friendships, and cooperation. Part of the Education Development Center, Inc. (EDC), PromotePrevent has a fantastic 13-chapter online resource on how to prevent bullying in early childhood and teach strong social skills. 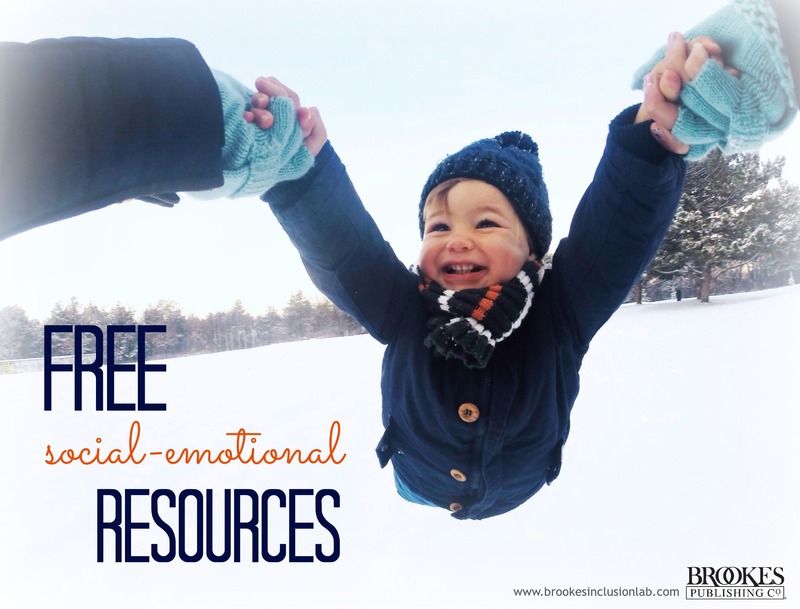 As we start the new year, we hope these resources help you encourage strong social-emotional development in the young children you nurture and support. If there are any specific social-emotional topics you’d like to see the Inclusion Lab cover in the new year, please contact me at jlillis AT brookespublishing DOT com and let me know! Congrats to all the winners of our December giveaway for the new Growing Strong calendar! Now you can download your own free copy of the calendar right on the Brookes website. 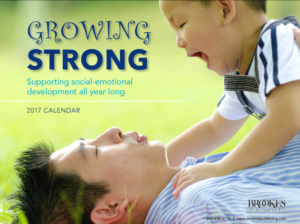 This calendar is filled with colorful photos and practical tips from some of the best Brookes books on social-emotional development. Use it all year to help you understand the behaviors of infants and toddlers and support the skills they’ll need to succeed in school and in life.